When are the news briefing going to be twice a day. Does anyone know? That news brief KLAAS posted above might be one of them....maybe. Just saw this on the facebook page for Hailey in case anyone wanted to sleuth SA. It is hearsay and not confirmed, so please take with a grain of salt. Beverly Preston Jacoby When I was in high school we used to go to a huge cave between CCity and Dunn. I cannot remember how to get there, but it ran along a creek, I believe. I hope someone will remember and check it for clues. I'm not a good digger, so the only thing I see is that it is an oil related company. Snyder is apprx 25 miles north of Colorado City. I wouldn't be too quick to discard the oil field worker theory. jmho My sister works for an office that deals with mineral rights etc. (landman), and she told me some months ago they had gotten busier lately, because there is renewed interest in oil, including abandoned & mothballed wells. These wells were abandoned or mothballed because they didn't produce enough oil to justify the expense of maintaining them. However, the price of oil has gone up, hence, the renewed interest. Plus, there are new wells going in. I wonder if there's been some of this kind of activity going on again in the area? Or even nearby? Saturday January 8, 2011 volunteer search parties canvassed the area around Dunn, Texas in search of Hailey Dunn. Dunn, Texas is located 10 miles from Colorado City, Texas. Dunn is where the grandmother of Shawn Adkins lives. Shawn Adkins is the last known person to see Hailey. Volunteer search groups met at the old Dollar General parking lot, located at 6th and Oak, at 9:30 am, 1 pm and 4 pm in Colorado City, Texas. Volunteers signed in at the search desk from as far as Austin, Texas. The groups conquered mesquite bushes, sticker patches, bobbed wire fences, cacti, steep ravines on foot and ATV's searching through abandoned houses, barns, oil leases, pastures, haystacks and metal troughs. Hailey Dunn was reported missing by her mother, Billie Dunn on December 28, 2010. On Monday December 27, 2010 at approximately 3:15 pm Hailey told her mother's boyfriend, Shawn Adkins, she was going to go to her Dad's house and then walk to her friend's house five blocks away to spend the night. Hailey's brother, David Dunn, called the friend on December 28, 2010 and at this time it was discovered that Hailey never arrived at her home and a sleepover had not been planned. Various law enforcement agencies are involved in the search for Hailey, including the FBI and the Texas Rangers. Law enforcement officers are conducting door to door searches of each and every house in Colorado City, Texas. The door to door search of the 1500 homes is expected to be completed January 8, 2011. The previous searches have included Hailey's home, a storage building, the Colorado River, local parks and wooded areas. Billboards and fliers throughout west Texas describe the missing cheerleader as 5 feet tall, 120 pounds, with long brown hair and hazel eyes. She was last seen wearing navy blue sweatpants, a light-colored short-sleeved T-shirt, pink and white tennis shoes or flip flops and red hoop earrings. Anyone with information regarding the disappearance of Hailey Dunn is urged to contact the Colorado City Police Department at 325-728-5294. SWEETWATER, Texas -- Sunday many are expected to gather at a prayer vigil in Sweetwater, to pray for Hailey's safe return. According to the Facebook page, "Find Hailey Dunn", the vigil will be Sunday at 5:00 p.m. at the First United Methodist Church's parking lot. Its located on the corner of 4th and Elm Street. Just last week, Colorado City held their own prayer vigil, where its estimated nearly 750 people showed. The vigil planned for Sweetwater is just one more way, surrounding cities and counties are getting involved, and showing they care. In the heat of the investigation into the disappearance of 13-year-old Hailey Dunn, authorities in Colorado City were called to investigate a reported child abduction case Saturday. A 15-year-old juvenile female was in Colorado City visiting and reported that a hispanic male tried to force her into his vehicle, according to a news release from the Department of Public Safety. Colorado City officers determined the alleged victim to be a runaway from Lubbock, Texas. Charges are pending against the 15 year old. Investigators believe this alleged event was not a part of the task force investigation. Saturday evening, Senior Trooper Sparky Dean told KTAB's Tiffany Tatro investigators and searchers hadn't found any evidence to indicate foul play in the disappearance of Hailey Dunn. While no one is ruling out foul play at this point, Dean said the case could still be a runaway. Dean says searchers hope to complete efforts in Dunn this evening and will then work their way south towards Colorado City. Colorado City City Manager Pete Kampfer tells KTAB's Tiffany Tatro law enforcement will be focusing in on the town of Dunn Saturday after going door-to-door in Colorado City Friday. Kampfer says a temporary command post is being set up in the small town approximately 12 miles north of Colorado City. "There are several areas of interest that will be explored by law enforcement officers," said Senior DPS Trooper Sparky Dean in a new release. "Some of these will be searched today and others possibly at a later date." Dunn is where searchers discovered oil field glasses and a knife sheath in a stream Friday evening. A volunteer searcher also told KTAB's Tiffany Tatro they discovered tire tracks leading to an empty field. The searcher said authorities were alerted. Law enforcement can't yet confirm they've visited that location. All of the discoveries occured within a mile of a home where the boyfriend of Hailey's mother is believed to be staying. Again, Kampfer says none of the developments or discoveries made by the volunteer search parties can be tied directly back to Hailey's disappearance. Senior Trooper Sparky Dean says he expects officers to complete the canvas of Hailey’s immediate neighborhood today. COLORADO CITY, Texas -- Now onto the latest in the search for missing 13 year old Hailey Dunn, police and law enforcement have spent the day combing a 6 mile stretch in the town of Dunn just north of Colorado City. They say some good leads sent them to that area. However they would not release any more information about those leads at this time saying this is an ongoing investigation. Adding that any evidence they find will be tagged and bagged and looked at thoroughly. More than 200 residents were also back out searching Saturday. Again 13 year old Hailey Dunn was last seen December 27th. Residents today told KTXS Hailey's disappearance has really shaken up the town. From the video at the link...picture of one of the billboard's along the highway. Oh no. I wasn't meaning there isn't ANY oil well work in the area. I really think that is probably the only work there is. I just meant it used to be a boom town area, and lots and lots of work there. I had heard they were working on some of the wells again since the price of oil is making it lucrative. I just mean that the economy is just not what it used to be. Could it be that Billie Dunn misinterpreted the implication of the words ... "Deception Indicated"? Could it be that both she and Shawn did not "fail" the polygraph? Could it be that Shawn was being truthful and ... it was Hailey was being deceptive regarding her plans? This is very interesting. Income is low, but so is housing. The one that blew me away was the largest percentage of jobs for males was lawman. Crime seems to be pretty low too, except for burglaries and theft. GRACE: Mr. Dunn, did you know that Hailey was on her way over? CLINT DUNN, FATHER: No, I didn`t. GRACE: How often did she come visit you? You live right across the street, correct? CLINT DUNN: Yes. She comes over every day. CLINT DUNN: At all times. She might come over for five minutes, she might come over and spend all day. She comes over every day. GRACE: Does she let you know she`s coming or does she just show up? CLINT DUNN: She just shows up. GRACE: Well, you know what? GRACE: OK. Let`s back it up a little bit. Did you see her at all that day? CLINT DUNN: I didn`t see her at all that day. Could it that Shawn is being truthful in regards to his last contact with Hailey? Did Hailey leave her home with the intention of visiting her father and then spending the night with Marybeth. In the process of elimination ... has Hailey's father been questioned and ... has his home searched? In the process of elimination ... has members of Marybeth's family been questioned and ... has their home been searched? A little girl is missing. All avenues must be investigated. According to Adkins, Hailey had plans to spend the night at Mary Beth Garcia’s home the night before she was reported missing by Billie Jean Dunn. Cecilia Garcia, Mary Beth’s mother, said Thursday that Mary Beth considers Hailey to be her best friend, but Hailey never had been to the Garcia home to spend the night. Mary Beth had spent the night at Hailey Dunn’s home once. GRACE: Now a woman in the community says she spotted Hailey that evening. This would have been Monday evening, with the little neighbor girl and the neighbor girl`s little boyfriend. What would he have been, 12, 13? Is that the little neighbor she was going to visit? B. DUNN: No. That was the girl she was going to visit. GRACE: What did this woman see? B. DUNN: She saw Hailey, Mary Beth and a boy that she didn`t recognize. GRACE: Now have you -- have you spoken with Mary Beth? Did that in fact happen? B. DUNN: I hadn`t asked her about that. I`m letting the police handle Mary Beth. I do call her to ask her hey, what did Hailey say to you on Monday, did she call you Monday, did you guys text, did she say she was going somewhere else Monday, or with another friend Monday, and she tells me no. GRACE: Did she say she even saw Hailey on Monday? B. DUNN: She hasn`t told me that she did. No. GRACE: OK. So to your knowledge, Hailey never went to Mary Beth`s? B. DUNN: Right. That`s what she says. Police, we`ve learned this week, brought in bloodhounds, and amazingly, those dogs were able to pick up Hailey`s scent. Yes, they tracked her exact path. They went from her mother`s home to her father`s home, and then from her father`s home to her friend`s home, which is a couple blocks away. But Nancy, this is where the story takes a tragic turn. The bloodhounds then track her scent to a motel in Colorado City. Nancy, why does a 13-year-old girl have any reason in the world to go to a motel? Right now, they`re scanning through the surveillance cameras, and we`re told so far, they have not seen Hailey`s pictures on those security cameras, but they`re continuing to look into that area. Maybe there`s another business there. Maybe there was a convenience store that maybe had a surveillance camera or a security camera. They`re hoping, they`re praying that maybe there was another camera in that area that was able to catch her picture. In the process of elimination in the disappearance of a little girl ... has investigators officially questioned Hailey's boyfriend ... the boyfriend who was unknown to Billie until three weeks prior to her daughter's disappearance? GRACE: Did your daughter have a boyfriend? BILLIE DUNN, MOTHER: She had a boyfriend that I didn`t know about, about three weeks ago, for a short time. NORTH OF COAHOMA - As the search continued for Hailey Dunn continued Saturday in Mitchell and Scurry Counties, volunteers are out in Howard County all weekend hoping to find Hailey Dunn and bring her home. More than 60 volunteers searched across the county for Hailey, including former Sheriff Dale Walker. "A group of civilians here in Howard County that have gathered together to share our efforts in trying to search. Today we're kind of focusing on the northside of the interstate. We also do have a group that's going on up and down the service roads of the interstate, taking those side roads east all the way to Colorado City." Including mothers Heather Maddox and Denise Coates. "We just are out here trying to do our part as moms, as citizens, as somebody who's really trying to help and find this baby and get her home. I have 2 daughters. I have 1 that's just a year older than Hailey is and I cannot even begin to imagine how this feels or what this mother is going through," said Maddox, who designed and is selling a t-shirt to help raise money for the reward pot. The search has special meaning to Vincent resident Machelle Barr, who is the 17-year old cousin of Hailey. "It's been pretty upsetting here lately. We've all been praying just trying to help us find the clues that we need to do to help her, get where we need to go look for her." "It's upsetting. I wish that I didn't have to believe all the false things that are going (around). I just wanna know what the true meaning is. I just, I hate all the rumors. I want to know if he (Shawn Atkins, the boyfriend of Hailey's mom) has something to do with it or the mom does." For now, everyone is hoping the blaze the right tracks that will lead to Hailey. "We'll be out here everyday until we find her," said Maddox. The search in Coahoma will resume at 8 AM Sunday at the Volunteer Fire Station. If you would like more information on the search in Howard County or to purchase a t-shirt, call Maddox at 213-4478. Coahoma and Forsan will both be hosting candlelight vigils Sunday at 5. COLORADO CITY - West Texans have come together to help search for missing cheerleader, Hailey Dunn. Everyday, people are showing up in droves, ready to help out. On Saturday, those folks told NewsWest 9, they're not giving up until they find Hailey. "I've got children and I hope that if it ever happens to me, I'd want the community and everybody to do the same for me," concerned resident, Timothy Boyd, said. 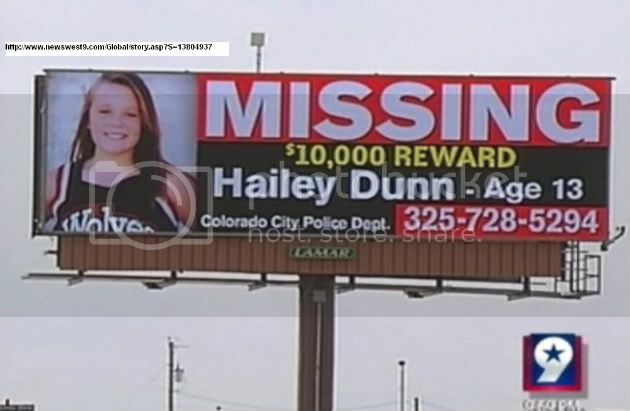 Without a trace of Hailey Dunn anywhere in sight, the citizens of Colorado City and surrounding towns are stepping up their efforts to find the missing 13-year-old. On Saturday, nearly 200 people came out on foot, on horseback and even on four-wheelers, trying to find anything that can lead to Hailey, but many of those people agree, they're hoping their search doesn't turn up anything. "Just looking for tracks, just looking for grass that's laid down, looking for thick wooded areas," Boyd said. "We hope we don't find anything of evidence in that, we're hoping that she's safe somewhere else." Word of Saturday's search spread fast on Facebook and it drew people from all over West Texas including Sweetwater and San Angelo, and even someone from Austin. "It makes me feel great, I mean, Texas cares and it shows," Volunteer, Bubba Limones, said. Limones helped organize the search. He and other residents said they never thought twice about their children's safety before Hailey vanished. "This doesn't happen here," he said. "I've lived here for 30 years and I was never scared of anything like this happening." Amber Austerman, a resident of Sweetwater, grew up in Colorado City. "It's just hard, I cant imagine, I cant sleep," Austerman said. "I don't think anybody can sleep at night if they're a mother." Whether it was feeling a parent's agony or just simply wanting to help out their community, searchers said they won't stop until Hailey is found. "Just to find her, just to make sure she's safe," Austerman said. "She needs to be at home where she belongs." Page created in 10.211 seconds with 19 queries.